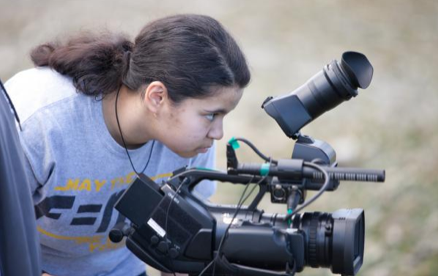 Newspaper Rock: Native filmmaking "on the fly"
By Florangela DavilaEach year, 50 teens from all over the country fly into Seattle to participate in a fast-and-furious film challenge. They have to produce short films in 36 hours, or "on the fly." Which is why the program is called "SuperFly." Most of the participants are Native Americans, creating Native-themed films out on location on an Indian reservation. Seattle filmmaker Tracy Rector and her Longhouse Media company launched the workshop 8 years ago. "Growing up in Seattle as a mixed race woman who’s indigenous, I was very aware that there were not representations of people like me. And I often felt very isolated," she said. The all-expenses paid workshop, held in partnership with the Seattle International Film Festival, brings together a multi-cultural group of youths. And in an effort to demystify Indian Country, the workshops are held on a different Indian reservation each year.Comment: For more on the subject, see Rez Sets Crowd-Funding Record and Vision Maker Seeks Native Movies. Below: "Raven Two Feathers of Seattle directs a short documentary about the Suquamish Indian tribe as part of the 2013 SuperFly Filmmaking Workshop."